The revolutionary design of the new SILENT Brass defies convention and allows players to conveniently store the mute in the bell of their instrument making this innovative mute an essential part of a brass musician’s equipment. Convenience is not the only benefit of the new design. The overall balance has been improved and allows players to adopt their natural playing posture. In a remarkably lightweight, compact unit, the new SILENT Brass mute achieves outstanding sound reduction whilst retaining stable pitch over a wide range, also ensuring optimum air flow. The ‘AUX IN’ mini jack allows players to connect their portable audio players or smart phone so that they are able to play along with a full accompaniment. "It seems Yamaha have taken into consideration most of the issues faced with using the old system. 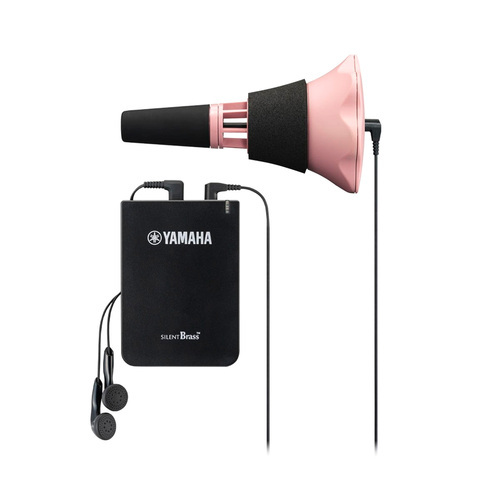 The mute itself is ultra light, flush with the bell and doesn't have the tendency to fall out like the last. The external sound from the mute is, as you'd expect is pretty minimal, the sound coming through the headphones is excellent, with two reverb settings you can be in a dry room or a concert hall, great fun! Best of all, the MP3 input allowed me to play along with the ireal app on my smartphone, which makes the SB7X02 more of an essential addition to my trumpet case than just an "invisibility cloak".